I’m writing this post to explain how important it is for business owners to have quality images of their products and services. Commercial photography can help showcase what your company has to offer. Poor images can be the sole reason for someone deciding to not purchase an item, and I don’t want that to be the case for you. I made contact with several of my past and current clients and decided to put together a short list of reasons why your business needs professional photos. My hope is that these 5 reasons help you realize the value of investing in professional photography to help display your vision, meet your sales goals, and elevate your company’s professional reputation. So, what is commercial photography? It is simply taking photos for the purpose of promoting and selling products and services. There are several ways to use photographs for marketing, including website/social media content, brochures, billboards, printed advertisements etc. 1. You will have a true representation of your brand. It is true that many companies use stock photos. Stock photos are professional photos that companies can buy online to use for promotion and advertising. Yes, you can use stock photos, but the questions is, “should you?” One issue with using stock images is that you do not get photos that will actually show someone using your products or engaging in the actual services you offer. Another issue is that other companies might use the exact same photos and this isn’t a good thing, especially if the other companies sell similar products and services, and if they are your competition. You and your company have a personality and stock photos may not be the best representation of yourself, your company, vision, or product. It’s important to have images that are a true reflection of what you do and show the personality of your company. 2. You will look more professional. I have worked with several upcoming small businesses that started off use images taken on their cell phone for promotion. Many small upcoming businesses actually use cell phone images to attempt sell something, and it doesn’t tend to go very well in many cases. Cell phone and low quality images are not beneficial for your brand. They are simply not good enough if your goal is to sell a product or service. Everything you post online represents your company. For example, people who sell clothing items should have images showing actual people in their clothing, and no, “selfies” in front of mirrors do not count. Quality photos will also help you stand out if you have images that show people wearing/using your products or engaging in the services you offer. 3. You will make more money. The money you invest on advertising will help bring more money into your business. Of course, this isn’t a guarantee, but people are more likely to buy something that looks good, makes them feel good, makes their life easier etc. Professional photos can help with this, because they will enhance your marketing. The better you are at marketing, the more people you attract, and the more money you ultimately make. Great photos can be a key factor in persuading someone to purchase what you have to offer. 4. You will have consistency throughout your advertising materials. It’s important to have quality photos to maintain a high level of consistency and professionalism throughout your company. Even photos taken from various people can have a negative impact the overall view of your company and products if the images do not have the same level of quality. It is important to let professionals take care of your photography needs to ensure high quality and consistency. 5. You will find marketing to be easier for you. Professional photos can eliminate the pressure you may feel to continuously generate content yourself. Photographing your products and services during an advertising campaign will leave you with a bunch of materials to use, eliminating the need for you to come up with marketing materials on your own. 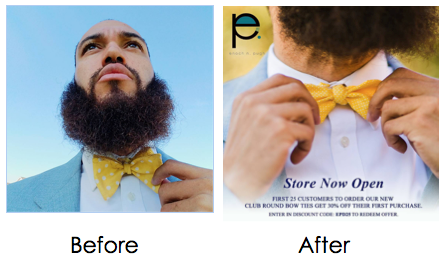 Here are some examples of how some of my clients previously promoted their company compared to the images I was able to provide for them, which ultimately made marketing their business easier for them. 1. You aren’t selling as much as you’d like. 2. You are just starting out and your business is new. 3. You are adding new products or services to your company. 4. You are using stock photos. 5. You take the majority of your advertising photos on your cell phone. 6. Your photos do not represent your business or products effectively. 7. You look at the photos you currently have and you don’t think they look consistent. 8. You look at the photos you currently have and the quality doesn’t match your vision. 9. You are not satisfied with the quality of work from the “free” shoot you booked. 10. You struggle to decide what images to use for marketing your business.